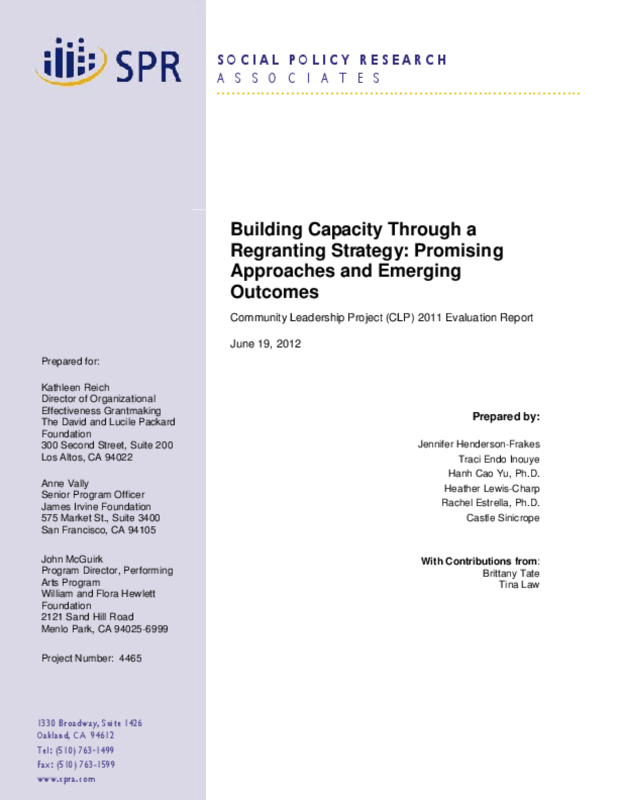 This is an evaluation report on the Community Leadership Project (CLP) in which 27 well-established intermediary organizations--community foundations, grantmaking public charities, and funder affinity groups--regrant to smaller organizations to provide financial support and tailored organizational assistance and coaching to small to mid-size organizations; technical assistance; and leadership development.The evaluation is interested in understanding not only the impact of CLP on leaders, organizations, intermediaries, and foundation partners, but also the key lessons on: (1) reaching and providing capacity-building supports to organizations and leaders serving low-income communities and communities of color; (2) characteristics of effective, culturally relevant, and community-responsive capacity building; and (3) which kinds of capacity-building supports are most effective for small and mid-sized organizations serving low-income communities and communitiesof color. Copyright 2012 by Social Policy Research Associates. All rights reserved.